Are You in Need of Emergency Plumbing Repairs in Austin But Ignoring the Signs? Most homeowners think they know when they need to call on a Austin plumber because it seems the signs should be obvious. A pipe in the basement springs a leak and you call in an expert for emergency plumbing repairs in Austin before your entire downstairs floods. Simple as that, right? What may surprise you is that many common plumbing issues show red flags but ones that you may not be able to pick up on. No one wants to end up with emergency plumbing service needs so it helps to be aware of some warning signs that might present themselves. Being an informed homeowner could save you a lot of headache, hassle and even money because you can catch the problem early. Low Pressure – If you notice a decrease in the water pressure that lingers, you should call a plumber. There are sometimes reasons for a drop and then the pressure returning to normal, but a steady drop to low or no pressure is not something to ignore. You could have a leak you cannot detect that can cause damage and cost you a lot in water loss. Gurgling Drains – It may sound funny, but it is really something that should be checked out. It can be as simple as removing a blockage in the pipes but still needs to be carried out by an industry professional. Screeching Noises – If your faucets make a screeching sound when turned on, this is usually the result of air in the pipes. However, this can happen as a result of the “bleed off” system not working properly. Toilet Backup – Of course this is going to happen occasionally. If it becomes an ongoing problem you need to call in an expert. This is often your system trying to tell you the septic tank needs to be emptied or that you are dealing with tree root infiltration. Rusty Water – This is more than an inconvenience, it is a health hazard. Plus, it is an indicator that your water heater probably needs to be replaced. The longer you ignore this, the worse the problem will get. The important thing is to make sure that you always rely on a reputable industry expert to take care of the plumbing repairs for you. 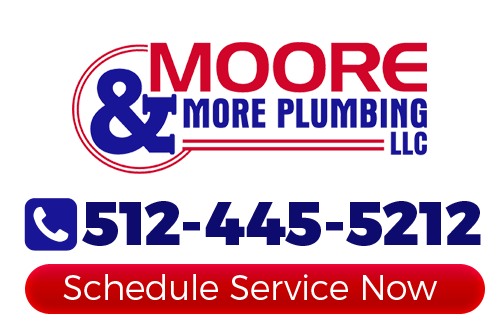 At Moore & More Plumbing, we have been providing our local residential and commercial clients with quality workmanship since 1986. We believe in going above and beyond when it comes to meeting the service needs of our customers. If you need emergency plumbing repairs in the Austin area, give our plumbers a call! If you need emergency plumbing repairs in Austin, TX, then please call 512-445-5212 or complete our online request form.